You may have heard soft rumblings of the next best thing in agriculture, of the future of agriculture, the new face, new way of doing things? If you have not heard yet, let us be the first to tell you that this is called Precision Agriculture! 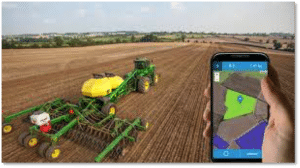 Whatever your knowledge about precision agriculture – a little, very little or, if you’re tech-savvy and ahead of the curve, perhaps a lot – let us invite you to read all you need to know about it here.! Enjoy, share and get excited about the future of our industry! Why do we need to produce more precisely? The postwar transformation of agriculture, known as the first “Green Revolution”, saved more than a billion people from starvation with serious unintended environmental costs. Now, a second revolution, built largely on technologies that comprise precision agriculture amongst others, promises to make the farm of the future more productive and efficient. 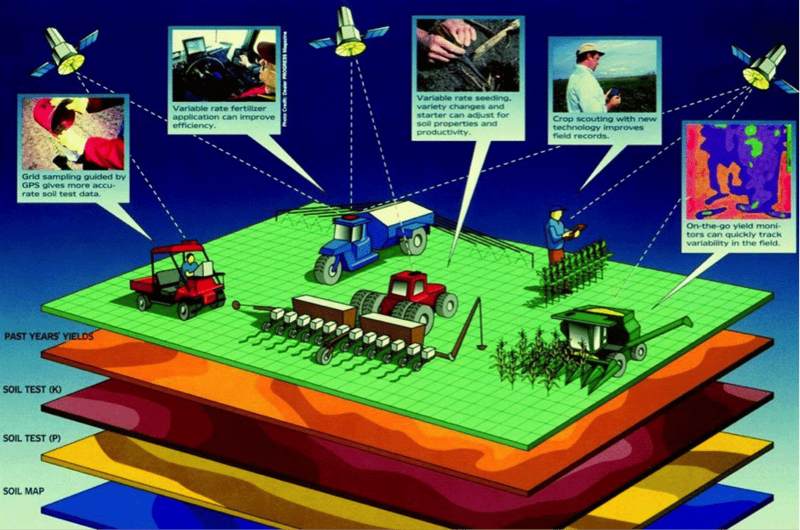 Precision agriculture is one of many modern farming practices that make production more efficient. With precision agriculture, farmers and soils work better, not harder. Think about precision as being ‘site-specific’ and ‘information-specific’, as in the most precise way of informing farming decisions. 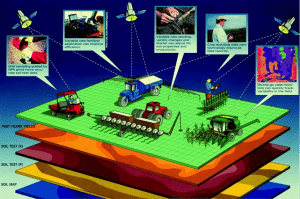 That is, farmers are able to take large fields and manage them as if they are a group of small fields through gathering information from the fields in real-time by observation and measurement, then responding to inter- and intra-field variability in crops. This reduces the misapplication of inputs and increases crop and farm efficiency. Farmers use precision agriculture practices to apply nutrients, water, seeds, and other agricultural inputs to grow more crops in a wide range of soil environments. Precision ag can help farmers know how much and when to apply these inputs. In South Africa, the grain sector (a traditional crop for AFGRI) faces undue pressure to produce maize profitably at export parity prices. In an effort to sustain profitable production, producers need to use the latest technology available – from seed to chemicals and mechanisation to training, including precision agriculture. It’s a case of maintaining a competitive advantage in a competitive global agricultural market; it’s not just a ‘nice-to-have’. What is enabling us to produce more precisely? With swarms of satellites, drones and sensors in our cadre, we are well equipped to engage in precision agriculture, aka satellite farming or site specific crop management (SSCM). What I mean is that a wave of innovations – from satellite geomapping developed by the US’s NASA to drones used to collect aerial data, to sensors used to collect moisture, temperature and other weather data on the land – provide insight into the health of the land on a real-time basis. Technologies such as advanced sensors and monitoring equipment now enable farmers to monitor crops more precisely and continuously, thereby enabling more strategic decision-making to increase productivity, with a reduced impact on the environment. What can we do now that we could not do before, you ask? From manipulating the growing environment to producing low-potassium lettuce to attaching sensors to cows to identify potentially sick animals, there is little question that the second green revolution holds the potential for remarkable results. Beyond increasing agricultural productivity, there are proven examples of increasing the nutritional value of food. For example, Fujitsu has produced a raw lettuce with less than 80 percent of the potassium content of traditionally grown lettuce; high potassium is unhealthy for people on dialysis or suffering from chronic kidney disease. Management zones; farming efficiency; precise decisions; site specific crop management; smart farming. was led by Norman Borlaug, an American agronomist who is considered to have “saved more lives than anyone who has ever lived” through his contributions These included the development of high-yielding varieties of cereal grains and the distribution of hybridized seeds, synthetic fertilizers, and pesticides to farmers. Borlaug’s contributions, as well as the widespread buildout of irrigation infrastructure and the adoption of modern management techniques, greatly increased yields without requiring an expansion in agricultural land.